I finished this shirt one month ago, to the day! But I didn't have time to take photos right away and then I kinda forgot to. I've already worn it twice, once to work and once to listen to jazz music. This shirt has rapidly become a staple in my wardrobe; I love it. I used New Look 6104. This pattern looks similar to Colette's free Sorbetto, except that there are a few sleeve variations. This was my first time making pin tucks and I think they didn't turn out too badly. They'll be better next time. Excuse the cat hair. Whitish cat, blackish shirt, you know how it goes! The red glass buttons are vintage, but I don't know from what time period. I bought these - believe it or not - at the Mall of America in Minneapolis. I've had them for over ten years. They originally graced a black button-down RTW shirt that I had. The shirt had boring black buttons so I replaced them. When I wore out that shirt, I made sure to save the buttons and I've been waiting for a chance to use them again. I still have a lot left (I think I have 24 in total) so I may make another plain black shirt and revive my original idea. Although two black shirts w/ red buttons may be overkill. I love this pattern. I've already cut out fabric to make a second one. In fact, it's been cut out for about 3 weeks. I haven't been sewing much at home lately! But the second version will be white (I'm using the leftover pique from my husband's Negroni) and with the little ruffle down the front. I didn't make any big adjustments to the pattern. I should've made the back darts smaller (or graded out to a 14 at the hips) as there is some fabric pooling back there due to my sway back. There are also some stress lines and rippling in the sleeves, so I could've done that better too, but I'm not going to worry about it. Since putting in the sleeves on my Burda jacket I think I'd do it better now, so the white version should show an improvement. I seriously think I could make 10 different versions of this pattern. 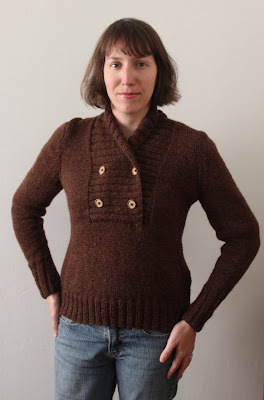 I love the neckline and I love the buttons down the front. And there are enough sleeve variations, etc. so that the finished versions wouldn't look too much like one another. This project sorta completes my Fall Essentials Challenge. I know, I know, this is not a fall garment! However, this is the last piece of fabric that I had slotted for the FESA. I originally meant to use it with a long-sleeve button-down shirt. 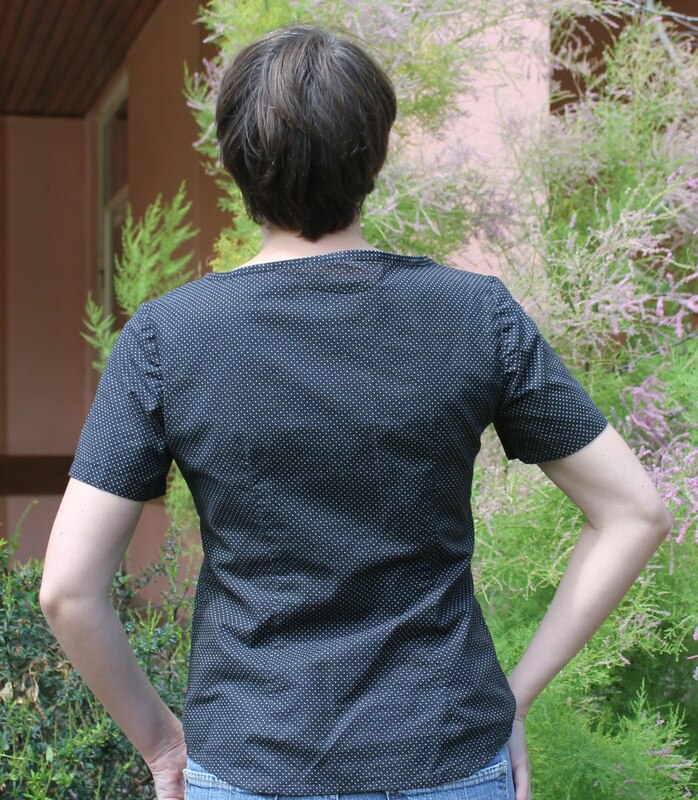 But when I went to make that shirt I realized I didn't have anywhere near enough fabric and would have to go with short-sleeves. Cute! I really like the scoop-y neckline on you-- it's really flattering! 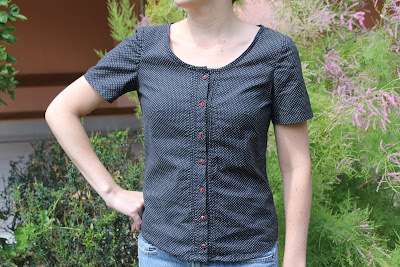 very cute top and I love those buttons! I'd love a closet full of blouses like this, but of course tackier, to fit my gaudy inclinations! Lovely! Oh, it is absolutely lovely, and those red buttons are perfect!! I can see why you saved them. It's hard to find amazing buttons. They set off that pretty and demure blouse so well. Very pretty blouse and lovely pintucks...something that I have not summoned up the courage so far to do.Gorgeous buttons too...I have some vintage glass buttons I want to use but at the same time I am loathe to as I suppose they could get damaged in the wash.
Oh, how lovely! Pin-tucks and polka-dots and lovely red vintage buttons! It looks great on you, a definite wardrobe staple! oooh lovely!! the contrast between the shirt and the buttons is fantastic!